If you still haven’t upgraded your home network to 802.11ac, or if you just want to fill in a few dead zones in the corners of your home, Amazon’s running a huge sale today on routers, range extenders, and more from TP-Link. Inside, you’ll find routers starting at $45, modems, range extenders, smart switches, ethernet hubs, and more, most of which is marked down to all-time low prices. This already-affordable range extender even has an extra $5 coupon you can clip. Just note that like all Gold Box deals, these prices are only available today, or until sold out. If you already use a magnetic smartphone car mount, you can put that plate behind your phone to use at your desk with Bestek’s gorgeous stand. Normally $10 to $12, you can get it for just $8 with promo code MGYRKCFS today. I have this sitting on my desk right now and absolutely love it. If most Bluetooth earbuds are too large or heavy to stay comfortably in your ears, iClever’s newest headphones are worth a look. The earbuds themselves weigh less than half an ounce each, and having tried them myself, I‘ll say that they’re just as light and comfortable as any wired headphones I’ve ever used. Get a pair for just $20 today with promo code KINJAB19. If you’ve been curious to try computer glasses, but were scared off by the sky-high price of Gunnars, Velocifire will sell you a set for $13 today with promo code VG1KINJA. If you aren’t familiar, the appeal of these things is that they block out the blue light that emanates from the screens we stare at all day, which can cause eyestrain, headaches, and even insomnia. If you’ve been meaning to get your dad some new clothes for Father’s Day but don’t know where to start, this one-day Amazon sale is the place. There are five pages of things to choose from, with brands like Izod, Dockers, Perry Ellis, Levis, Herschel Supply Co., and more. Maybe you can grab something for yourself while you’re looking, but these prices only last for today. Kubo And The Two Strings has everything a perfect family movie could need: beautiful animation, anthropomorphic animals, and a feisty, young main character who has to save the day. And for $10, it’s something that should be on your Blu-ray shelf. It’s a great day to pick up a new DualShock 4, with every available color marked down to just $39 to $40 on Amazon. 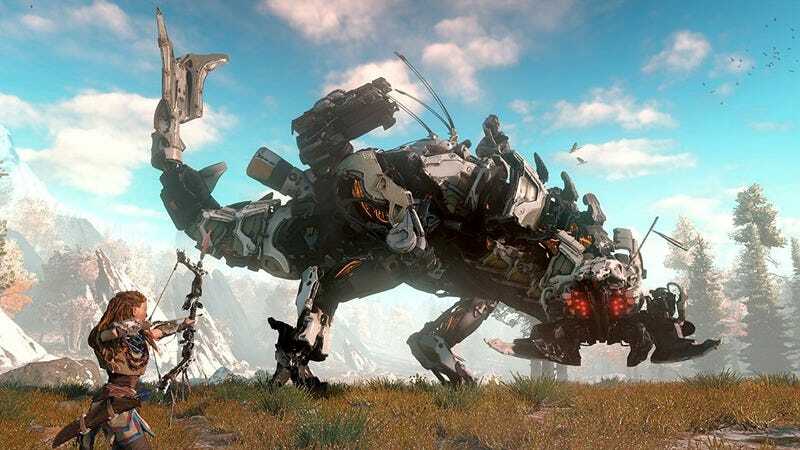 Horizon Zero Dawn is an instant classic and one of the best games you can buy for the PS4, so it’s not surprising that we haven’t seen any big discounts on the game until today. If you own a PS4, you’d be crazy not to buy it at $40.